After so many years as a culinary professional, I’ve had to rethink much of what had been automatic, almost autonomic, in cooking. Now, in my forno, there’s a live fire set ablaze with well-seasoned oak, black walnut, grape vines and big bunches of last year’s lavender, sage and rosemary. Il forno demands attention. I’ve made the mistake of walking away and getting involved in some other task—a phone call, an email, a little prep in the kitchen. Then there’s the mad dash back outside. Has the fire burned too low? Did I forget to check the chicken? Does the paella need more stock? I am fully aware that this may sound silly to the uninitiated, but once I let go of old habits from gas and electric cooking (like I must control everything and the food must perform as I demand), the wood-burning oven became more of a partner in the cooking process (“It’s a game of give and take”.) This is a group effort for me, the oven and the food. We’re bound together in our delicious dance. I bend a little more in terms of time and temp (it’s too hot or not hot enough; it’s taking too long or it’s cooking too fast). The food dictates its own needs based on size, age, ripeness. I worry less that the food comes out at a specific time or that it’s as flawless as a Michelin-starred meal. I’m more relaxed. My guests are more relaxed. A calm cook makes better food. There’s more time for conversation—the best part of any meal. Last weekend, I took my time. I fed my sourdough starter on Thursday after I salted and refrigerated a roasting chicken. Friday I made a high-hydration sourdough bread dough in the morning. After doing several stretch-and-folds and waiting 3 or 4 hours, I patted down the dough and then rolled it out until I had a big rectangle. While this rested for another 20 minutes, I chopped parsley, lemon zest and garlic very finely and grabbed some fresh herbs—sage and rosemary—from the garden. I carefully tucked the parsley mixture under the skin of the chicken. I put the other herbs into the cavity. Then I gently placed the chicken on the bread dough and wrapped it like a present. Back into the refrigerator it went until Saturday when I took it out and let it come to room temperature. It was only then that I put it into my 500-degree (more or less) wood-burning oven. It was a big chicken so it took nearly two hours to cook. I kept it loosely covered with foil so I didn’t have to worry about the bread getting scorched. I roasted some Brussels sprouts and red peppers during the last half hour and baked another loaf of sourdough bread. Oh, it was worth three days of fiddling. It was the most moist, most flavorful chicken I’ve ever eaten. 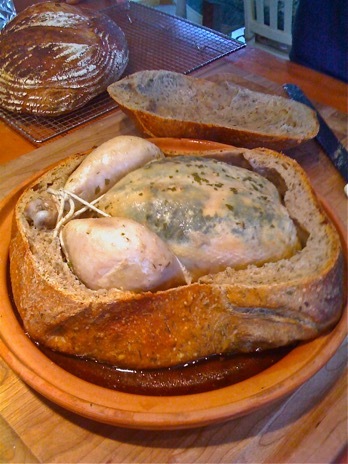 And the bread around it had absorbed all that herbaceous chicken juice.